Two wonderful and fascinating books on Maya writing have appeared in the last few months. A new (third) edition of Michael Coe’s Breaking the Maya Code has just appeared. This is a fascinating story of practical cryptanalysis of ancient texts. It is a gripping read; and a fascinating story of applied linguistics and archaeology. (In terms of discussion of approaches to cryptanalyzing ancient tongues, I would rank it equally high with John Chadwick’s The Decipherment of Linear B. Also of interest is Richard Parkinson’s Cracking Codes: The Rosetta Stone and Decipherment. However, the decipherment of Maya and Linear B is far more interesting than the decipherment of Egyptian hieroglyphics, since Maya and Linear B were broken based on internal analysis alone, while the Rosetta Stone allowed for relatively easy understanding of Egyptian hieroglyphics.) Coe’s book not only covers the technical aspects of deciphering Maya; he also talks about the Maya culture and especially the academic infighting that has characterized Maya studies in our time. In the end, the truth won out over academic politics. The book is accessible and fun. The new edition covers the latest (and rather brilliant) developments in the last 13 years. There is a companion volume that teaches one the basics of Reading the Maya Glyphs. A much lighter, but highly enjoyable book is Matthew Restall and Amara Solari’s 2012 and the End of the World: The Western Roots of the Maya Apocalypse, based on a course that they will teach at Penn State. This book is not only about Maya culture, but also about millenarianism, millennialism, chiliasm, Western apocalyptic thought, the book of Revelation, and Western appropriation, translation, and distortion of non-Western cultures. 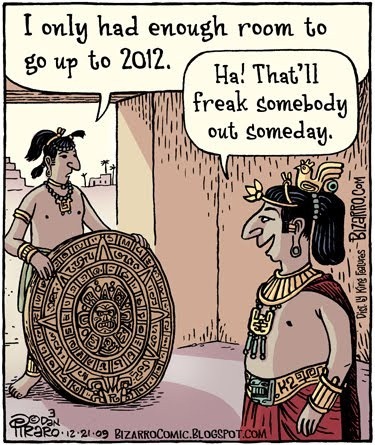 At the end, one learns that various predictions of doom on December 21, 2012, are more about Western thought than Maya thought. It is great fun and fascinating stuff – no one is such a polymath that she would know everything that this book discusses. On a broader scale, the decipherment of Mayan has contributed to the discussion of why writing started independently in only 4 (possibly fewer) locations worldwide. All of the languages involved had predominantly single syllable morphemes, a prerequisite for writing system development. This is an essential but not sufficient condition for the origin of writing. I don’t know whether Coe goes into this or not. The latter television documentary, Cracking the Maya Code, is also available for viewing online. If there’s ever a year to take Matthew Restall and Amara Solari’s course and/ or to read their book, then 2012 is it.